WASHINGTON (AP) Even with John Wall struggling through migraine symptoms, the Washington Wizards continued their renewed commitment to defense. 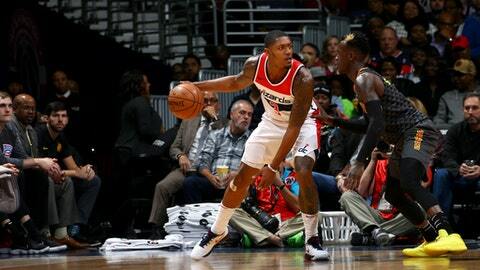 Bradley Beal scored 19 points on a day when Wall skipped the morning shootaround and most of pregame warm-ups, and the Wizards forced the Atlanta Hawks into a season-worst 24 turnovers in a 113-94 victory on Saturday night. Markieff Morris scored 18 points, his most since returning from sports hernia surgery earlier this month, and Kelly Oubre added 18 off the bench. That was enough to guide the Wizards to a second straight win while keeping a visiting opponent under 100 points. They’d allowed 110 or more in their first five games at Capital One Arena. The Wizards shot 54 percent from the floor. Taurean Prince scored 19 points and Marco Belinelli had 15 for Atlanta, which failed to keep it close despite turning Washington’s season-high 23 turnovers into 37 points. Hawks leading scorer Dennis Schroeder had seven points on 2 of 16 shooting. He missed all eight of his first-half attempts. It was an 11-point game before Washington’s second unit began the fourth quarter on an 18-2 run. That allowed coach Scott Brooks to keep rest his starters for the remainder of the game. Hawks: Have allowed at least 110 points in seven consecutive games. … Attempted 19 3-pointers in the first half, making eight. … F Mike Muscala (ankle) missed his fourth straight game. Wizards: Began the game 0 for 9 from beyond the arc before Morris’ 3-pointer cut it to 37-36 with 4:08 left in the first half. Beal followed with another 3 to give the Wizards the lead for good. … Wall picked up his fourth foul with 4:34 left in the third quarter. He sat the rest of the night with the game out of reach. Oubre led a Washington bench that outscored Atlanta’s 54-37. He also had eight of the Wizards’ 14 steals. In his fifth game back from injury, Morris shot 8 of 10 from the floor and 2 of 3 from 3-point range. He also blocked two shots and made a steal. Brooks raved about the atmosphere at the arena the Wizards share with the Capitals after attending Washington’s 4-1 victory over the Pittsburgh Penguins on Friday night. He admitted he didn’t understand all the nuances of hockey. ”To me, it was a lot of turnovers,” he quipped. Hawks: Finish a three-game road swing at New Orleans on Monday. Wizards: Close a stretch of six out of seven at home on Monday against Sacramento.